They were arrested after their daughter escaped from their home where police found some of her siblings chained to their beds and severely malnourished. 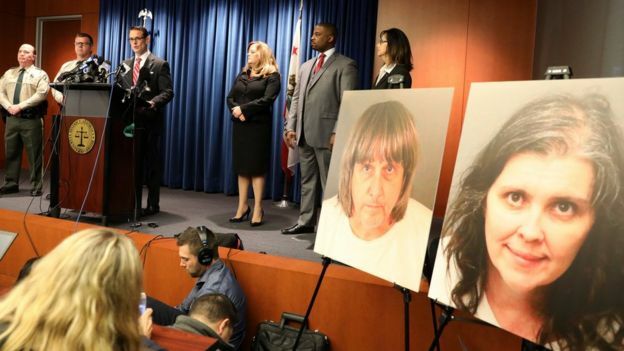 Riverside County District Attorney Mike Hestrin said the couple had allegedly punished their children by tying them up - first using ropes and later chaining them to their beds with padlocks. If the children washed their hands above the wrist they were subjected to punishments, allegedly accused of "playing with water"
Mr Turpin, with a distinctive mop of grey hair, was chained around the waist, his stomach protruding from beneath the metal links. His wife's mouth was turned down in a glum expression. The children, who are aged between 2 and 29 , have been treated in hospital since being freed on Monday. The 2-year-old was of normal weight but the other children were severely malnourished, authorities said. The 12-year-old weighed as much as an average 7-year-old and the 29-year-old weighed only 82 lbs (37kg). Several of the children have cognitive impairment and "neuropathy, which is nerve damage, as a result of this extreme and prolonged physical abuse," Mr Hestrin said. Mr Turpin also faces one count of "lewd act on a child under 14 years of age". Mr Hestrin said that when officers arrived, three of the couple's children were chained to their beds.